Skimble’s featured Workout of the Week is the Harvard Health Resistance Bands & Tubes, in honor of this week’s Health 2.0 2012 conference in San Francisco! Just one year ago, Skimble presented its Workout Trainer app and earned the highest judges score at Morgenthaler’s DCtoVC showcase during Health 2.0. This year, we’re excired to introduce to you our latest program within Skimble’s Workout Trainer app, the Harvard Health Gym Coach! We’ve been collaborating with the smart folks at The Harvard Medical School to deliver workouts that give you results! This week’s FREE Workout of the Week is the Harvard Health Resistance Bands & Tubes gives you a sneak peek into the NEW Harvard Health Gym Coach program. With the assistance of a stability ball, wide elastic resistance bands or resistance tubing with padded handles, enjoy this full-body strengthening workout. Before doing most of these exercises, please firmly anchor resistance tubing to a door or other structure. If you enjoyed this workout, achieve your fitness goals with the full Harvard Health Gym Coach program, available in Skimble’s Workout Trainer application. The Workout Trainer app can be downloaded for free and provides an in-app purchase of enhanced features and program functionality. The Harvard Health Gym Coach is the newest program, which features workouts from the Harvard Medical School Workout Workbook, from Harvard Health Publications. The Workout Workbook was created by Harvard Medical School doctors working with fitness trainers to provide a safe, expert workout regimen that can be modified for users with varying fitness levels. 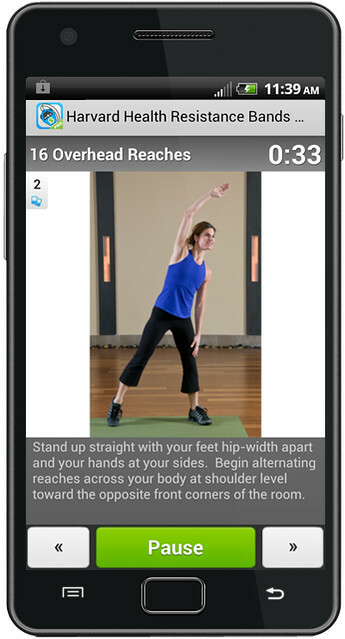 The Harvard Health Gym Coach is offered at an introductory price of $14.99, which is a one-time in-app purchase in the free Workout Trainer app. The Harvard Health Gym Coach purchase allows members to complete the 3-week program with multimedia coaching as many times as they’d like. The Harvard Health Gym Coach workouts feature audio coaching soundtracks, timing cues, motivational messages, and reminders with customizable schedules. Try it today!